Saint-Basile Cemetery is designated a Local Historic Place for being the oldest final resting place in Madawaska County. It is also recognized for the pioneers who are buried there and for the sculpted works done by people from the region. 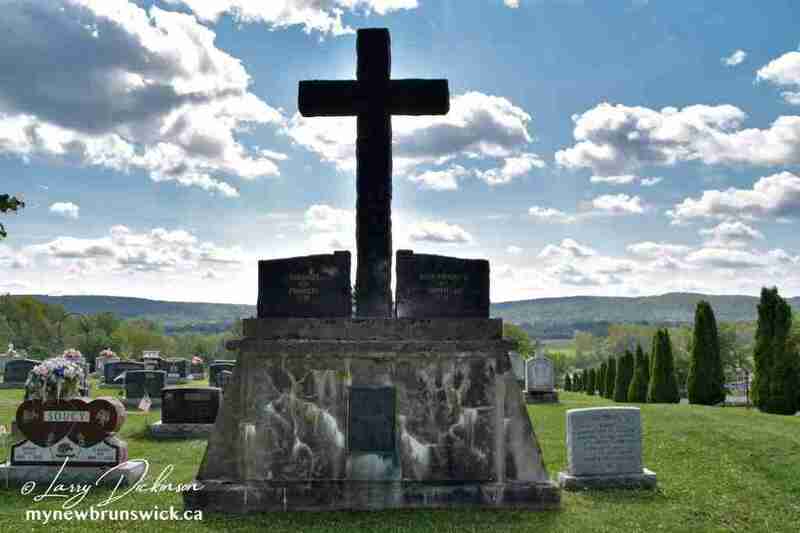 Still in use today and currently enclosed by a wrought-iron fence on two sides that opens into three portals on the front, the Saint-Basile Cemetery was the first cemetery in the Madawaska region. It has provided a final resting place for the people of this community for more than 200 years. The first grave goes back to circa 1790. The oldest known tombstone dates from 1802. Saint-Basile Cemetery is recognized for the graves of important figures in Madawaska’s history. Father Benjamin Saindon spent 16 years of his sacerdotal life in Saint-Basile. He founded a colony near Pont-Prime in Saint-Basile and had the Calvary erected in the cemetery. Msgr. Louis-Napoléon Dugal left his mark on local history through his dedication to society by creating 14 parishes and spending 53 years of his sacerdotal life in Saint-Basile. A marble stone is dedicated to Marguerite “Tante Blanche” Thibodeau Cyr, whose charitable work in the area during the Black Famine of 1797 earned her the title of “aunt of Madawaska”. The heritage value of this cemetery also lies in the sculpted works found there. A granite monument to the cross was created by Rino P. Martin and René Doucette in the memory of the forefathers whose names are engraved on a bronze plaque. A Calvary composed of four statutes, assembled by Alphonse Pelletier and Lévite Bois, is located across from the cemetery’s main entrance at the end of a path interspersed with sculpted stone plaques, representing the procession of Christ.